So may flavors, so little time. I had heard that David Lebovitz’s book The Perfect Scoop was a good ice cream resource, so I checked it out of the library. 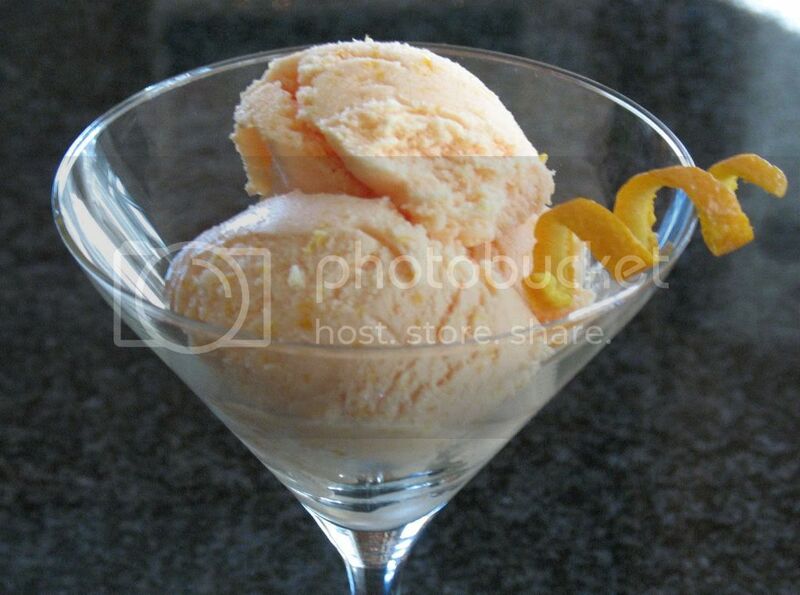 I now have a list of nearly two dozen homemade ice creams, sorbets and sherbets that I want to try. I was pleased to find that Lebovitz goes into great detail explaining how to make the perfect ice cream custard and offering suggestions for ingredients and mix-ins. I’m definitely adding this book to my kitchen wish-list. After perusing the grocery store circulars and seeing that strawberries, oranges and Oreos were on sale, I narrowed my potential recipes down to the following: Strawberry Frozen Yogurt, Strawberry Sorbet, Orange Popsicle and Cookies & Cream. With the start of spring, something fruity and light sounded really good. My husband was particularly intrigued by Orange Popsicle, so I set out to buy a bag of oranges (on sale!). Check back in the future, as I plan to try the other recipes over the next few months. Zesting the oranges gave me the opportunity to use one of my new favorite kitchen tools: my rasp-style Microplane Grater. I used to zest citrus with a box grater, but that was rather difficult and messy. I always ended up with irregular size chunks of zest, and so much of it would stick to the grater. Lebovitz actually addresses these two tools stating that rasp-style graters (like the Microplane) will extract almost twice as much zest as a box grater! Good to know. Squeezing the oranges was interesting, as the only citrus squeezer I have is sized for a lemon. After three oranges, I gave up and augmented with some orange juice from a carton of Tropicana. I think a manual juicer like this may be in my future. Since this recipe does not use egg yolks, it doesn’t need to be heated. Once I finished the arduous task of squeezing oranges without the proper tools, the rest of the prep work was completed by my blender. I only modified the recipe slightly. As mentioned above I used some carton orange juice. I also ignored Lebovitz’s warning and used fat free half and half. Finally, I added an additional tablespoon of sugar and an extra teaspoon of triple sec to the ice cream base. Once the base was mixed, it had a yellow-y cream color. For aesthetic purposes, I added a few drops of food coloring and colored the base a light orange. After refrigerating the base, running it through my ice cream maker and freezing for several hours, the ice cream was as delicious and refreshing as it looked! It has a smooth, creamy orange-y flavor – a more decadent, grown-up version of the classic creamsicle. This homemade ice cream has the consistency of a sherbet, and the addition of triple sec makes it easy to scoop right out of the freezer. It tastes fantastic on it’s own, or sprinkled with miniature chocolate chips. I’m also looking forward to serving it as a summer dessert, garnished with fresh fruit. 1. Pulverize sugar and orange zest in blender. 2. Add orange juice, sour cream, half and half and liqueur. Blend until the sugar is completely dissolved. 3. Chill the mixture in the refrigerator for several house and then process in ice cream maker according to manufacturer’s instructions. I haven’t had a creamsicle since I was a kid. This brings back so many memories!